Department of Adult Nursing and Paramedic Science, Faculty of Education and Health, University of Greenwich, London. Centre for Maternal and Child Health Research, School of Health Sciences, City, University of London, London. Royal College of General Practitioners, London. Background Women may not seek help for perinatal psychological distress, despite regular contact with primary care services. Barriers include ignorance of symptoms, inability to disclose distress, others’ attitudes, and cultural expectations. Much of the evidence has been obtained from North American populations and may not, therefore, extrapolate to the UK. Aim To understand the factors affecting women’s decision to seek help for perinatal distress. Design and setting Meta-synthesis of the available published qualitative evidence on UK women’s experiences of seeking help for perinatal distress. Method Systematic searches were conducted in accordance with PRISMA guidelines. Databases searched were PubMed, Scopus, PsycINFO, PsycARTICLES, CINAHL, and Academic Search Complete. Searches of grey literature and references were also conducted. Studies were eligible for inclusion if they reported qualitative data on UK women’s experiences of perinatal distress and contact with healthcare professionals. The synthesis was conducted using meta-ethnography. Results In all, 24 studies were eligible for inclusion. Metasynthesis identified three main themes: identifying a problem, the influence of healthcare professionals, and stigma. These themes build on current understanding of help seeking by identifying the need for women to be able to frame their experience, for healthcare professionals to educate women about their roles, the need for continuity of care, and the way that being seen as a ‘bad mother’ causes women to self-silence. Conclusion Perinatal care provision needs to allow for continuity of care and for staff training that facilitates awareness of factors that influence women’s help seeking. Further research is required, particularly in relation to effective means of identifying perinatal psychological distress. Women are vulnerable to a variety of psychological difficulties during the perinatal period. Such women may be reluctant to access health care and to disclose their mental health symptoms, potentially adversely affecting the development of their child and the wellbeing of their partner.1 To address this situation, a greater understanding of what influences women’s behaviour is needed. The existing literature focuses predominantly on North American populations rather than perinatal populations in the UK, where perinatal health care is more easily accessible. Therefore, this study reports a meta-synthesis of the qualitative literature on what influences women’s help-seeking behaviour for perinatal distress in the UK. Barriers to help seeking for perinatal psychological distress include the woman’s inability to disclose her feelings, cultural obstacles, ignorance about symptoms of postnatal depression (PND), and/or how to obtain help, and the attitudes of family, friends, and healthcare professionals (HCPs).11 However, research has focused almost exclusively on PND in non-UK samples and is concerned with treatment preference rather than help-seeking per se. In the UK, services are structured differently. Access to help for perinatal distress is usually through primary care services, such as the GP, midwife, or health visitor, and is provided free at the point of delivery. Furthermore, UK guidance regarding perinatal mental health suggests that women should be screened on first contact with health services to identify those who may need further assessment. It also recognises that women may choose not to disclose their distress.12 This review focuses on help seeking in women experiencing perinatal psychological distress in the UK, where systematic, structural barriers to accessing help are reduced due to care being provided free at the point of delivery. Psychological distress and problems are common in pregnant women and new mothers, but very few women access treatment. Awareness of women’s experiences is important to inform primary healthcare practitioners of how best to help women with perinatal distress. The authors reviewed qualitative studies of women’s experiences of seeking help for psychological distress in the UK. Findings showed that women’s help seeking is influenced by identifying something is wrong, their experience with healthcare professionals, and stigma. Searches were conducted in accordance with the PRISMA statement,13 in Academic Search Complete, CINAHL, PsycARTICLES, PsycINFO, PubMed, and Scopus. Boolean search terms combined help-seeking terms with perinatal and mental health terms, and returned 10 954 articles (Figure 1). A search of the grey literature and back-searching identified 26 additional articles. Duplicates were removed (n = 1886). Titles and abstracts were screened, and 37 full-text articles were examined for eligibility. Articles were eligible if they presented primary research evidence from the UK concerning women seeking help for psychological distress experienced during pregnancy or the first year postpartum. 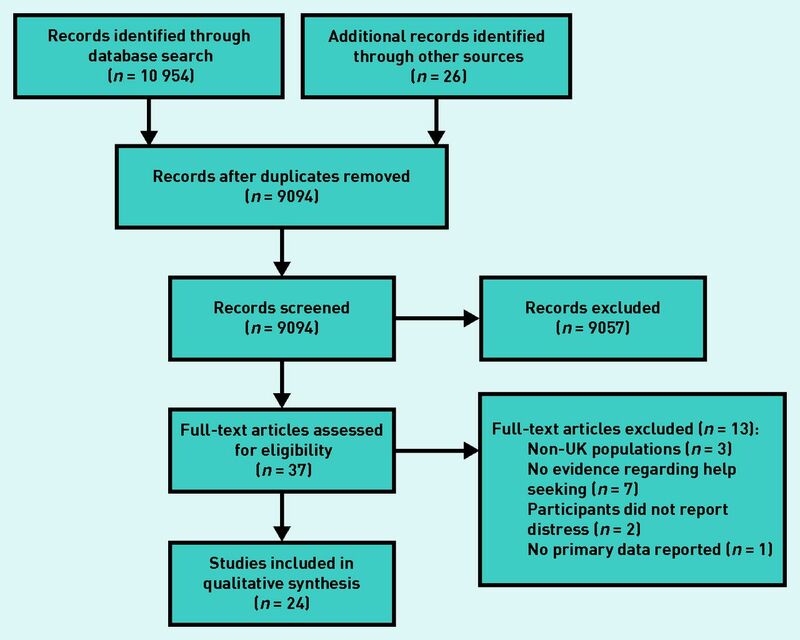 Articles were excluded if they concerned only non-UK populations, did not report evidence regarding help-seeking, if participants had not experienced distress, or if they did not present primary data. A total of 24 studies met these criteria. The quality of the studies was assessed using the Critical Appraisal Skills Programme guidelines.14 Quality varied from good to very good (range 0.5–0.85, further information available from the author on request). No studies were excluded on grounds of quality. The meta-synthesis was performed by two researchers independently using a meta-ethnographic approach.15 This allows data from different studies to be synthesised, preserving the terminology of the original studies and, therefore, the meaning.16 Articles were read and key themes extracted. Each theme was tabulated and illustrated with first- and second-order constructs:17 specifically, direct quotes from participants (first order) and authors’ analysis of interview content (second order). Common themes emerged through the process of reciprocal and refutational translation.15 The meta-synthesis was constructed using second-order constructs. First-order constructs were used to illustrate and directly support themes, while enabling them to be traced back to the original studies. Researchers subsequently created third-order constructs (‘the views and interpretations of the synthesis team’)17 in order to generate new understandings of the data. These third-order constructs were discussed and agreed by the wider research team. First-order constructs were used to support and validate the findings. All 24 studies identified were concerned with seeking help for PND. Nine explored this concept in minority groups living in the UK.18–26 Three studies had mixed samples,27–29 five had predominantly white samples,30–34 and seven did not report ethnicity,35–41 21 used interviews to gather data, four with focus groups. Three key themes emerged from the meta-synthesis: identifying a problem, the healthcare experience, and stigma (Table 1). Stigma manifested itself in several ways: self-judgement, concern about others’ judgements, symptom normalisation, external attribution, and anxiety around consequences of stigmatisation. This stigma deterred women from seeking help. There were three clear factors affecting whether women seek help for perinatal distress: identifying a problem, the healthcare experience, and stigma. These are important for effective identification and treatment of women in primary and community health settings. From ‘identifying a problem’ it is clear that women may not understand the significance of their symptoms. This may explain why women do not seek help for perinatal psychological distress.1 In the UK, women are screened for PND at around 6 weeks postpartum. This review confirms not all women find screening helpful,12 and some misrepresent their symptoms on the screening tool. Women may conceal symptoms and only seek help once they reach ‘crisis point’. Furthermore, some women are unable to communicate how they feel; either because they do not understand their symptoms, or because they do not have the vocabulary to articulate them. This is consistent with the notion that help seeking requires the recognition of a problem and a conscious decision to address it,4 but goes further in identifying that women need to frame their experience in a way that others can also understand and support. That support may differ according to women’s cultural, religious, and social contexts. The evidence suggests that women who receive help for perinatal mental illness achieve better outcomes for both themselves and their babies,42 although the impact for women experiencing less severe symptoms of psychological distress is unclear. One difficulty, potentially, is deciding when to intervene. Some level of distress may be inevitable, such as that associated with sleep deprivation. In these instances, women may not require formal intervention, but practical and emotional support. However, women still need to feel able to ask for that help. Consistent with the wider literature, the perceived stigma of mental illness deterred women from seeking help.6 This meta-synthesis also identified that women felt under pressure to be ‘good mothers’ and that ‘failure’ impacted negatively on their mental health and their likelihood to seek help. This is consistent with other reports of the relationship between mental wellbeing and ‘being a good mother’,45 and that the fear of failure may cause women to ‘self-silence’. This includes deliberately misrepresenting how they truly feel to HCPs involved in their care. The combined fear of stigma and the high expectations that women have of themselves further undermine their self-worth, increasing distress.46 More understanding of this process by HCPs may help improve how they approach and interact with new mothers. Perinatal care services need to be developed in a way that meets women’s needs for continuity of care, and for staff training to increase awareness of factors that might impact on the likelihood of seeking help. More research is needed in this area, particularly in relation to improving detection of perinatal psychological distress. This review has highlighted that women do not always understand their symptoms and, even if they identify that there is something wrong, may not be able to articulate how they feel. Furthermore, the fear of being seen as a ‘bad mother’ and of being stigmatised for not being able to cope can lead to women ‘self-silencing’. This includes deliberately misrepresenting how they truly feel to HCPs involved in their care. The meta-synthesis was confined to evidence from the UK, published in English. It captures the diversity of UK society, but much of the UK literature focuses on traditional minority groups, such as Afro-Caribbean and Bengali populations, while neglecting others. Furthermore, the literature is primarily concerned with PND, despite evidence that women and men experience mental illness during pregnancy, not just after birth, and may commonly suffer from anxiety disorders as well as depression. There is clearly a need for increased primary evidence around help seeking in relation to antenatal psychological distress, including for minority groups and fathers. Researchers aimed to reduce subjectivity of data interpretation by conducting independent analysis, but recognise that subjectivity cannot be completely avoided in qualitative work. HCPs need to understand that help seeking involves recognition of a problem and a conscious decision to address it. Therefore, educating women and their partners about perinatal mental health and the roles of the different HCPs should form part of routine antenatal care. Furthermore, the importance of continuity of care and trusting relationships for help seeking suggests that consideration should be given to both service structure and staff training. One strategy may be for women to receive crossover care from a dedicated midwife and health visitor, working closely with the woman’s GP, during the third trimester/early postnatal period. This would increase continuity and facilitate timely access to care. This would require careful consideration of the caseload implications for HCPs, who are often overworked. Furthermore, greater consideration needs to be given to the NICE recommendations about screening women, including how stigma and interactions with HCPs affect this, and whether the current model is fit for purpose. It is important to identify methods that elicit women’s confidence in disclosing how they feel, combined with increasing HCPs’ ability to detect and manage situations where women avoid disclosure. There also needs to be further investigation of the impact of seeking help on outcomes for women experiencing less severe forms of psychological distress, and the most appropriate means of educating HCPs to meet women’s needs. The authors gratefully acknowledge the input of Louise Phillips in the initial stages of developing this review. This work was funded by the Research Sustainability Fund at the School of Health Sciences at City, University of London (RSF-2014-ST). Revision requested March 8, 2017. (2009) Maternal depression: a global threat to children’s health, development, and behavior and to human rights. Child Dev Perspect 3(1):51–59. (2004) Psychological distress: concept analysis. J Adv Nurs 45(5):536–545. (2014) Perinatal distress in women in low and middle income countries: allostatic load as a framework to examine the effect of perinatal distress on preterm birth and infant health. Mat Child Health J 18(10):2393–2407. (2011) Help-seeking behaviour: a concept analysis. Int J Nurs Pract 17(3):280–288. (2012) Conceptual measurement framework for help seeking for mental health problems. Psychol Res Behav Manag 5:173–183. (2013) A systematic review of the literature exploring illness perceptions in mental health utilising the self-regulation model. J Clin Psychol Med Settings 20(3):263–274. (2015) What is the impact of mental health-related stigma on help-seeking? A systematic review of quantitative and qualitative studies. Psychol Med 45(1):11–27. (2007) Perceived public stigma and the willingness to seek counseling: the mediating roles of self-stigma and attitudes toward counseling. J Couns Psychol 54(1):40–50. (2014) Factors that influence young people’s mental health help-seeking behaviour: a study based on the Health Belief Model. J Adv Nurs 70(11):2577–2587. (2008) Do ‘alternative’ help-seeking strategies affect primary care service use? A survey of help-seeking for mental distress. BMC Public Health 8:207. (2006) Postpartum depression help-seeking barriers and maternal treatment preferences: a qualitative systematic review. Birth 33(4):323–331. (2015) Antenatal and postnatal mental health: clinical management and service guidance. CG192 (NICE, London) https://www.nice.org.uk/guidance/cg192?unlid=4298883492016928123635 (accessed 17 Aug 2017). (2015) Preferred Reporting Items of Systematic reviews and Meta-Analyses. PRISMA, http://prisma-statement.org/ (accessed 17 Aug 2017). (2014) Critical Appraisal Skills Programme. Making sense of evidence. CASP, http://www.casp-uk.net/casp-tools-checklists (accessed 17 Aug 2017). (1988) Meta-ethnography: synthesizing qualitative studies (Sage, Thousand Oaks, CA). (2011) Br J Gen Pract, ‘It’s leaflet, leaflet, leaflet then, “see you later”’: black Caribbean women’s perceptions of perinatal mental health care. DOI: https://doi.org/10.3399/bjgp11X567063&#39. (2008) ‘We don’t see black women here’: an exploration of the absence of black Caribbean women from clinical and epidemiological data on perinatal depression in the UK. Midwifery 24(4):379–389. (2006) Perinatal depression: its absence among black Caribbean women. Br J Midwifery 14(11):646–652. (2004) Perinatal depression among black Caribbean women. Health Soc Care Comm 12(5):430–438. (2010) Ethnicity and mental health encounters in primary care: help-seeking and help-giving for perinatal depression among black Caribbean women in the UK. Ethn Health 15(1):93–111. (2004) Experiences and understandings of social and emotional distress in the postnatal period among Bangladeshi women living in Tower Hamlets. Fam Pract 21(3):254–260. (2003) The experiences of postnatal depression in women from black and minority ethnic communities in Wiltshire, UK. Ethn Health 8(3):207–221. (2007) The emotional wellbeing of Bangladeshi mothers during the postnatal period. Community Pract 80(5):34–37. (2014) The experience of postnatal depression in West African mothers living in the United Kingdom: a qualitative study. Midwifery 30(6):756–763. (2012) Parent perspectives of clinical psychology access when experiencing distress. Community Pract 85(4):34–37. (2009) ‘Creating a safety net’: women’s experiences of antenatal depression and their identification of helpful community support and services during pregnancy. Midwifery 25(1):39–49. (2011) Inequity in provision of and access to health visiting postnatal depression services. J Adv Nurs 67(11):2350–2362. (2006) Mothers’ experiences of postnatal depression: an interpretative phenomenological analysis. Community Pract 79(8):256–260. (2015) Postnatal posttraumatic stress: a grounded theory model of first-time mothers’ experiences. J Reprod Infant Psychol 33(3):238–255. (2016) Older mothers’ experiences of postnatal depression. Br J Midwifery 24(1):28–36. (1997) Postnatal depression: how can midwives help? Midwifery 13(4):163–171. (1999) ‘Feeling low and feeling really bad about feeling low’: women’s experiences of motherhood and postpartum depression. Can Psychol/Psychologie Canadienne 40(2):143–161. (2009) Disclosure of symptoms of postnatal depression, the perspectives of health professionals and women: a qualitative study. BMC Fam Pract 10:7. (2010) Br J Gen Pract, Postnatal women’s experiences of management of depressive symptoms: a qualitative study. DOI: https://doi.org/10.3399/bjgp10X532611&#39. (2003) A qualitative study of the acceptability of routine screening of postnatal women using the Edinburgh Postnatal Depression Scale. Br J Gen Pract 53(493):614–619. (2006) A study of Welsh mothers’ experiences of postnatal depression. Midwifery 22(2):147–157. (2013) Meeting the challenges of teenage mothers with postpartum depression: overcoming stigma through support. J Reprod Infant Psychol 31(4):352–369. (1993) Postpartum depression: women’s help-seeking behaviour and perceptions of cause. J Adv Nurs 18(2):178–184. (2013) An exploration of illness beliefs in mothers with postnatal depression. Midwifery 29(6):682–689. (2007) Effects of treating postnatal depression on mother–infant interaction and child development: systematic review. Br J Psych 191:378–386. (2010) Suporting patient autonomy: the importance of clinican–patient relationships. J Gen Int Med 25(7):741–745. (2016) Midwife-led continuity models versus other models of care for childbearing women. Cochrane Database Syst Rev 4:CD004667, doi:10.1002/14651858.CD004667.pub5. (2015) Brief online self-help exercises for postnatal women to improve mood: a pilot study. Matern Child Health J 19(11):2375–2383. (2016) A concept analysis of women’s vulnerability during pregnancy, birth and the postnatal period. J Adv Nurs 72(10):2330–2345. (2013) A milestone year: a year of tackling stigma and discrimination in the words of the people who made it happen. Annual report 2012–13, http://www.time-to-change.org.uk/resources/research-and-reports/annual-reports (accessed 17 Aug 2017).